Here at Arise and Shine we are proud to announce a new very impressive product that we are now offering to our customers worldwide. If any of you have ever experienced an injury or have damaged yourself, then we now have a product for you. It is called People Putty. One of the reasons we are so excited about this product is because it is made by our friend White Crow, who is a master herbalist with over 30 years experience and training in the holistic medicine field. He has studied with such greats as Dr. Christopher, Dr. Bernard Jenson, Dr. Richard Shultz and others. A product that is as completely natural as this and has such a reputation of healing behind it, is very unique. I have known White Crow for over twenty-five years. In fact we met at Dr. Jenson’s Healing Sanitarium in 1985. This is about the time that I noticed him using this product on himself and asked him what it was. He responded, “Why it’s called People Putty and it is for putting us back together when we have damaged ourselves”. He explained how active he was in the snowboarding and surfing world, and that injuries were common if a person was pushing the limits. He said, “I had to come up with a way to keep myself on the ski slopes, as I could not handle any time off, especially due to an injury”. At that point in his life his goal was to board at least 100 days a season. I asked him to explain how he came up with this formula. He told me that after studying intensely for a few years and learning extensively from various teachers, as well as communing with nature, he had a creative spark and inspiration from the Great Spirit. This happened as he was sitting one day on a mountain top in Utah’s Wasatch Mountains. The creative force and inspiration flowed and he wrote down the formula almost exactly as it is today. Although during the last 20 years, there has been much experimenting done and several additions and subtractions made to the formula, to bring it to the state it is in now. Even such little changes as using the sprayer atomizer for the easiest application method brought about its share of research. There was the problem of how to keep the thick solution, full of rich healing demulcent mucilage, from clogging the sprayer. Now that is kind of a funny expression, “demulcent mucilage”, however, that is one of the keys to People Putty’s effectiveness. This simply describes a gelatinous substance of various plants that contains protein and polysaccharides, which can soothe or protect any abraded mucous membranes and tissues. Most all traumas to the body need this healing property. I tried some back then on a sore knee, and it worked so well, that even to this day I do not leave home without it. So I asked what’s in this stuff. White Crow answered, “It’s one of the finest combinations of herbs on planet earth”. And “Nothing will repair and rejuvenate the body and its tissues better and faster, why I have seen miracles happen with the use of People Putty”. As one customer said, “its a twenty thousand dollar operation in a twenty dollar bottle”. White Crow continued, “Of course it contains Comfrey. 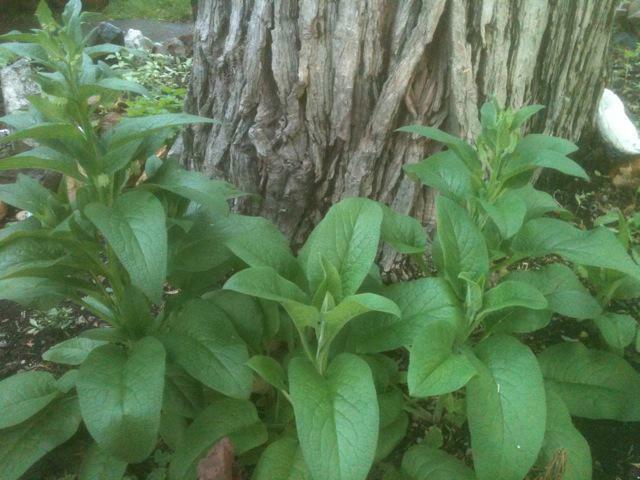 For over 2500 years, Comfrey’s use has been recorded, since Alexander the Great to the present. Comfrey has been mending the battle scars and injuries of human kind. 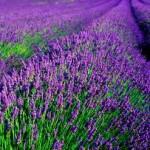 There simply is no finer healing herb for the repair of tissue. “Comfrey is the queen of all healing herbs,” He said: “especially for speedy recovery. In this formula both the leaf and root are used for maximum benefit. Comfrey contains numerous healing constituents and one of them is an active ingredient called ALLANTOIN, which is a cell proliferant (causes cells to grow faster). Allantoin has been known to rebuild cells and connective tissue, dispersing bruising and encouraging the formation of new cells. Both the leaf and the root can contain up to 1% allantoin. Comfrey is anti-bacterial, an anti-inflammatory, a soothing emollient, and helps speed healing up to three times faster than normal. Comfrey helps skin irritations, relieves arthritis, tendonitis, scar tissue repair, and so much more. I sat amazed at the creation of this product and all the research that went into developing it. 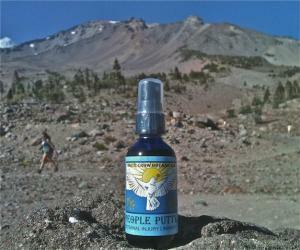 People Putty is also very easy to use and all one has to do is to shake, spray it on and rub in several times a day. The Putty leaves a notable coating that will be absorbed for hours thru the skin and into the tissues. It’s easy and works for everyone it seems. I asked how many people that it has helped and he said literally thousands, and has a book of testimonies to back that up. 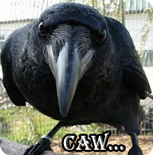 I have given Crow several of my own testimonies and have heard numerous people tell me that they could hardly believe that it worked so well and so fast. Last summer I accidentally slammed my knee on a rock and then had to hike out with a sore knee. That night when I went to bad, my knee ached. After tossing and turning and trying numerous positions, I still could not get to sleep. So I got up and in the dark found my bottle of people putty and rubbed it in. In less than a minute I returned to bed and went right to sleep. Later in the morning I marveled on how fast it worked. About a month ago, after returning from a hiking trip, an old friend pulled up to Arise and Shine and had her 78 year mother in the car. I went to say hi. Her mother got out of the car gave me a hug and said: “Watch this” and she strolled across the payment in a hurry walking upright. Then she demonstrated to me how she was walking only two weeks ago. All bent over, barely able to take a step. Then she said: “Crow’s People Putty took all my pain away and straighten me out. Rich, I’ve been in pain for years and this only took one week. 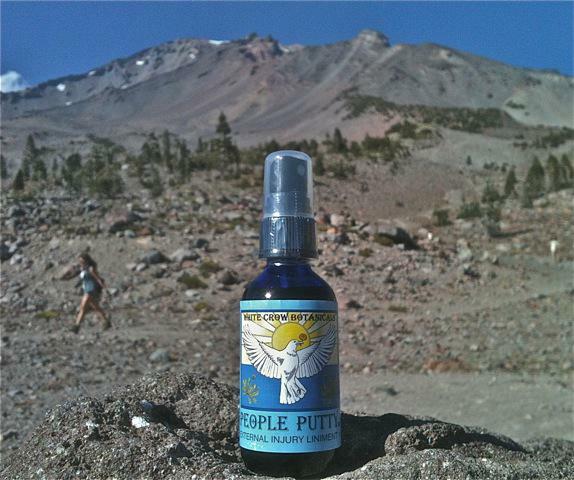 It’s the most amazing product I’ve ever seen.” They had come by to pick up more people putty. This is typical. I cannot tell you how excited we are at Arise and Shine to offer this product to our customers. In closing, for all those who are struggling to find a product that works and bring relief to life’s little challenges and past or new injuries, I say, AWAKEN TO A NEW YOU. Remember it is our opportunity to create a new body. It is scientifically well known that every cell is replaced in less than seven years and the body is always in a state of change so when we can add extra help like People Putty, our ability to heal is tremendously improved. Truly we are blessed.